Now that Chicago won't host the Olympics, can we create "gold medal" thinking about ways to help kids from poverty win their race to futures? Read on? When I first became a volunteer tutor at the Montgomery Ward program almost 35 years ago, I had no idea that I'd someday be writing articles like this to encourage others to become involved. What transformed me over these years? What if hundreds of places where volunteers connect with inner city youth were trying to transform their own volunteers for the same benefit? I attend many meetings where the problems and tragedies of poverty are discussed. Almost all bring together many people with personal experience and good ideas. However, a time in the meeting comes when we talk about funding, and then we all recognize that this is a problem, then we go on and talk more about the problems, and what we could do IF we had the money. 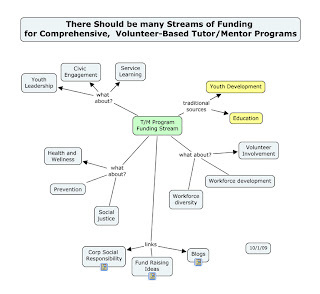 I focus most of the articles in this blog on what steps we might take to increase the flow of resources to all tutor/mentor programs in a geographic area, on a long-term basis, which includes money, but also includes talent and technology, and ideas. Yesterday as I sat in another meeting, I scribbled out some concepts, which I later polished up on a concept map. If you've skills in animation, you could do even more with this idea. This chart shows a cycle that takes place almost every day, in hundreds of locations throughout the country. However, it may be happening with less purpose and impact in most places, than is needed to change the flow of resources to tutor/mentor programs. Let me try to break this down for you. The first step in volunteer involvement is creating advertising, or network building, that motivates a volunteer to seek out a place where he/she can get involved. This could be our Cabrini Connections program. It could be one of the programs on our list of Chicago programs. It could be one in any other city, found by searching through any of these volunteer-matching systems. Th e next stage of volunteer involvement is on-going. This involves the coaching, training, and peer mentoring that a volunteer receives in the program where she became involved. This also involves the learning which a volunteer does on his own to build his skills as a tutor/mentor. This type of support varies dramatically from place to place, depending on the level and experience of staffing, and the structure of the program. If a volunteer is well supported, and if the student attends regularly and is not what we call a "volunteer killer" (meaning they don't want to work, are disrespectful, or don't attend regularly and the volunteer gets frustrated and quits), then the volunteer will stay longer with the program. Now com es the important, trans formative stage. As volunteers who don't live in poverty become personally involved with kids who do live in poverty, they begin to learn more about issues and challenges the kids deal with on a daily basis. They begin to become more interested in learning more about these issues. Some will do this on their own. However, some programs make an effort to broaden the volunteer's understanding of the issue by organizing conferences, training sessions, or by providing reading materials, or on-line libraries of information that the volunteer can learn from. Each week, as the volunteer grows his/her relationship with the youth, they also grow their understanding of the issues. If the program nurtures this, the volunteer takes the next step, to becoming an advocate for the student, the program, and the tutor/mentor industry. Initially this might be the volunteer making contact with the student's parent, or teacher. It might grow to making a greater effort to find study ideas, and college and career resources. It might lead to creating a part time job at the volunteer's company for the student, or other students in the program, or to recommending speakers and other resources. As the volunteer shares his weekly experiences through informal story telling, a few friends and co-workers may offer to join her as a volunteer. If the volunteer is coached, or self-motivated, he might begin to raise money to support the organization. Some volunteers might join fund raising committees, or even become part of a board of directors. If this is happening in many programs, in the same city, or in multiple cities, and the number of volunteers increases, the impact of their informal networking can result in more volunteers becoming involved, and more people donating money to support their programs. However, if there are face-to-face events, or on-line platforms, where volunteers from the same program, for from different programs, can connect with each other, then the sharing of information can include more people, and the hosts of these events can become more strategic. 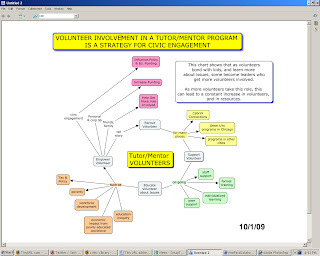 Imagine if we were able to attract two or three thousand volunteers from tutor/mentor programs in Chicago, New Y ork, Detroit, Miami, LA and other cities to the same on-line forum. What if a volunteer said, "I'm from Microsoft. Are there any other volunteers from there?" This could lead to volunteers who work in the same company, same industry, or attended the same college, forming groups where they share tips and ideas that enable each member to be more effective in how he supports his/her own student. It could also lead to these volunteers beginning a process of "What could we as a group, or as a company, to to support our programs more consistently? Or, What could we do to improve the quality and experience, and retention, of key staff members who are essential to coaching volunteers and students into long-term involvement? What could we do to lower the costs and frustrations of fund raising?" Such discussions, happening in many groups, could lead to a more strategic understanding of a tutor/mentor program and how we transform the lives of kids, by transforming the lives of the volunteers who we recruit from areas beyond poverty, and from the many industries who benefit from a well-trained and diverse workforce. Ultimately, such strategies would increase the number of well-organized, volunteer-based programs, where leaders incorporate this thinking into their own core strategies, which would just lead to a greater on-going growth in the number of volunteers who are involved and transformed. I call this a Service Learning Loop. You can see an animated version of this here. Instead of thinking of a shrinking economy and support system, we should be thinking of this as a growth strategy. I encourage you to borrow the charts I post on this blog for your own articles, brain storming and visioning. Just point a link to us as the source. You can find essays with some of these ideas in the Tutor/Mentor Institute. I also encourage you to join me and others at the conference we host in Chicago every November and May, or in on-line forums where we can meet without the costs of travel. If you're a writer, graphic designer, film maker, or student looking for an internship, or for a masters, or PhD project, we offer the Tutor/Mentor Connection and Cabrini Connections as a place where you can learn, and where you can apply your talent to enhance and improve what we're doing. I really like the service learning loop and would like to incorporate your visual graphics in our partnership development and donor development initiatives. Your content is extremely valid and resonates with our agency. We have urban and rural settings in our county, which is adjacent to the mostly urban/suburban county that contains Cleveland. I hope to contribute to this body of knowledge with insight pertaining to volunteer coaching, training, and the resulting self-motivaiton that continues the loop you describe in your article. Big Brothers Big Sisters of Lorain County, OH is exploring opportunities to share and collaborate with researchers like yourself. Great stuff!